Something pointy, scary, and perhaps sexually charged arrived at my door this week. He slowly entered my home, knife dragging behind him, with a crazy man dangling in his grasp. Jumping right out of one of the best games ever made, Pyramid Head of Silent Hill 2 fame is now something we can invite into our homes. Produced by Gecco Corp and ToyMunkey Studios Inc, the Red Pyramid Thing figure is being distributed worldwide outside of Japan and can also be purchased from trade shops for roughly $150MSRP (don’t be fooled by Japanese imports for twice that price). Now that RPT is in hand and sitting on my table, I thought I’d let you guys know what I think of his pretty, little details. The 13” figure of RPT has an immense amount of detail in his smock. Seams and gashes on the fabric which appear to reveal damaged flesh litter his form. Several buckles extended from the figure (2 on the front and 2 on the back) and a zipper can be found between its shoulder blades. Stains and an overall discoloration set the base tone of the smock. RPT’s flesh is a sickly grayish tan color with a spatter of visible veins, strong gashes, and exposed muscle. 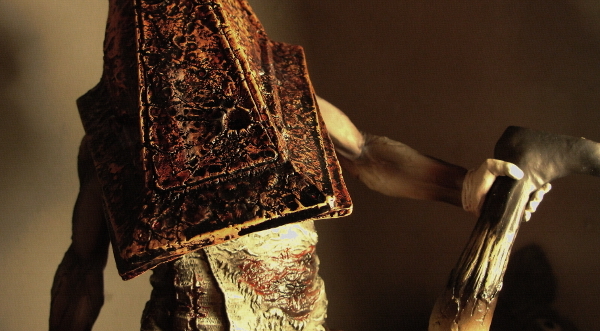 Despite being the classic Pyramid Head design, with a 7-sided dome, muscle detail is very visible on this sculpt. The sculptor, Shinya Akao of Headlong, specializes in male figures and it shows in the lean masculine arms. Not very visible within the games itself or noticeable due to the game’s dark visuals, are clumps of flesh that spans the underside of RPT’s helmet. Obtruding from the back of the helmet (or head), a wad of flesh can be seen with a bolt sticking out of it. The helmet (or head) itself is a rusty, flaky, orange-red and black object with a bolt and hole on the surface. The cracking rust looks exceptionally detailed here. That iconic blood-rust color is ever present. Aside from the helmet, Pyramid Head is known for his Great Knife. The knife is the only part of the figure that has to be attached when removed from packaging. I’m frankly too afraid to see if I can remove it after I set it in place. The knife’s overall texture is quite nice. The only downside I see here is a lack of a unique mark on it. The paint job is good and accentuates the texture of the knife, but its fairly uniform across its form (aside from a bolt on the backside of the hilt). A small observation but I felt that some type of distinctive mark would have given the knife a little more pizzazz. Pyramid Head is known to be a lonely fellow. It’s hard to find the guy without something—or someone–in his grasp. This figure is essentially two in one. In PH’s grasp is a Lying Figure creature. The contorted straight jacket monster is suspended upside down. An immense amount of detail can be found on the Lying Figure’s groin area, thighs, and even its backside. Within the cracks on its legs ridiculously small muscle strands can be seen. Its head contains folds that give it the appearance of being wrapped in loose bag-like skin. Its torso and back reveals hints of skin tearing and stretching. It was quite a surprise to see the Lying Figure come with RPT as one purchasable unit. I’d say that’s some value to be had. Would it be odd for me to talk about a figure’s box as if it was something worth displaying? Well, it is. The box for this figure contains new art by series creature designer Masahiro Ito. His latest rendition of Pyramid Head is beautiful to look at. Being printed on a 14 inch box also makes it a potential display piece of its own. 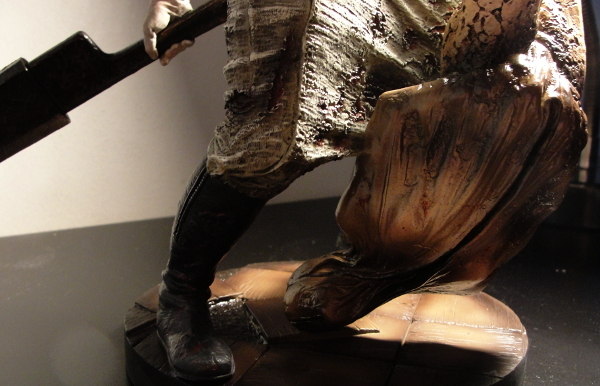 The backside of the box contains the 9-square design from Silent Hill 2, which acts as a display window for the figure. Inside the box there is a paper backdrop that can be removed and set behind the figure itself. The design of the backdrop is also the iconic 9-square save point but as an image. Avid Silent Hill collectors will be hard pressed to find much to dislike about this figure. ToyMunkey’s offering is already cheaper than the Konami Style Pyramid Head that we saw three years ago; it’s also the Silent Hill 2 version, not the muscle bound version seen in Silent Hill Homecoming and the two feature films. This rendition of Pyramid Head is the classic design in an action pose with a second creature in hand, which means there’s a whole lot of monster in this package. With an incredible amount of detail in the sculpt and the paint job, this monstrous Silent Hill creation is gorgeous in all of its disturbing qualities. The pretty box art and backdrop insert is a nice bonus to top it all off. I just may have to prevent myself from caressing it from time to time.